There are numerous grades of knife steel. 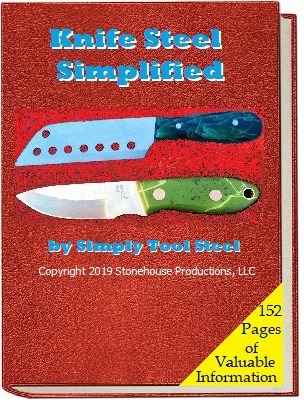 The list of available knife steel grades goes on and on. We won't cover all of them, but we will cover the commonly used grades. As automobiles have developed since the Conestoga wagon, tool steels have also developed. With current advances in tool steel technology it is logical to choose an up-to-date tool steel. A knife is one of the longest standing tools in the history of civilization. Cavemen sharpened rocks or flint to use as a cutting tool. Early swords were made from bronze and with the development of steel came the industrial revolution. Steel alloys started out as simple alloys. Grades like O-1 and M-2 have been around for about 80 years. O-1 was one of the first tool steel grades and M-2 was the second high-speed steel grade which was specifically developed for use as a cutting tool. Blacksmiths began forging low alloy steels more than 100 years ago. Gradually more alloys were developed by adding more elements. Tool steels were born. During the past 80 years, tool steels have evolved with the technological developments in the steel-making process. Coal and coke ovens dominated the early industrial revolution, producing relatively poor quality steels. Tool steel quality was inconsistent at best. Grade selection was limited by this poor quality. Tool steel grades during this early period consisted of O-1, O-2, W-1, W-2, W-3, L-6 and high-speed grades like M-1, M-2 and T-1. Most of these grades are now extinct. The survivors include O-1, W-1, L-6 and M-2. The past 40 years has seen the introduction of tool steels made from powder metal. This process again has led to many new grade developments including all of the PM grades. This process allows alloys to be made with upwards of 40% alloying content. By adding more alloying content, the steels properties can be dramatically improved. The powder metal process also allows for unprecedented quality.